Celebrated annually on the 31st of October, the tradition of Halloween dates back to an ancient Celtic festival of Samhain (pronounced sow-in). It was said that the veil between the Otherworld and our world thins during Samhain, making it easier for spirits and the souls of the dead to return. In an effort to ward off ghosts, people would light bonfires and wear costumes or make offerings of food in order to get on the good side of these spirits. In the eighth century, Pope Gregory III designated the 1st of November as a day to honour saints, which soon became known as All Saints Day. The evening before was known as All Hallows Eve and later Halloween. It’s said that the Scottish poet Robert Burns helped to popularise the word Halloween with his 1785 poem of the same name. The holiday has changed over time, transforming from an ancient tradition to the flashy fright-fest we know today. 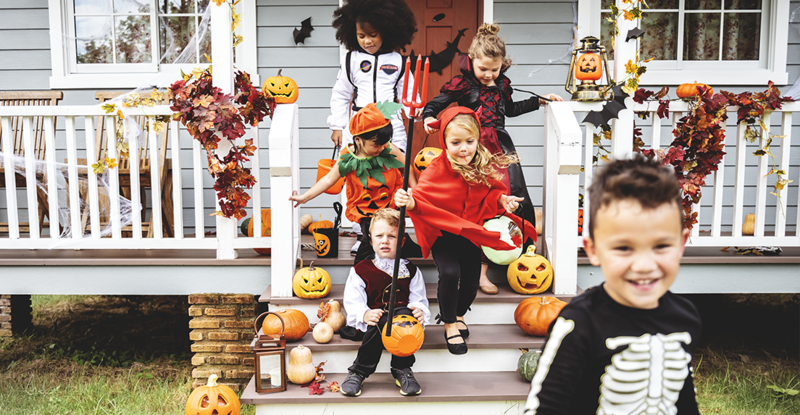 Bobbing for apples, pumpkin carving and trick or treating have their origins in interesting stories as well. Bobbing for apples is not just a party game, but was an act that was considered a form of divination performed around Halloween, where people would dunk their heads into a vat of water and try to bite into floating fruit in a quest to figure out their future spouse. Ladies would mark an apple and toss it into the tub. The thinking was they'd be destined to whoever pulled it out of the water. Pumpkins carved into intricately designed creations are impressive decorations but back in the day, folks in Ireland dubbed their carved, fiery turnips ‘jack-o-lanterns’ thanks in part to an ominous legend. The legend says that one night, a conniving local drunkard named Jack, trapped the Prince of Darkness in a tree by hacking a sign of the cross into the bark. In exchange for letting Satan climb down, Jack had him vow to never claim his soul. Jack proceeded to act like a jerk his whole life. When he died, he sure as heck was not allowed in heaven. So he tried to return to his old pal, the Devil. But Satan upheld his end of the deal, hurling a piece of coal from hell at the dead man, for good measure. Left without anywhere to go, Jack placed the blazing coal in a turnip to use as a lantern. The dead man then set out, doomed to wander until he could find an eternal resting place. From 1000 A.D poor people would visit the houses of wealthier families the night before Samhain and receive pastries called soul cakes, in exchange for a promise to pray for the souls of the homeowners’ dead relatives. This practive became known as ‘souling’ and was later taken up by children, who would go from door to door asking for gifts such as food, money and ale. In Scotland and Ireland, young people took part in a tradition called 'guising', dressing up in costume and accepting offerings from various households. Rather than pledging to pray for the dead, they would sing a song, recite a poem, tell a joke or perform another sort of ‘trick’ before collecting their ‘treat’, which typically consisted of fruit, nuts or coins. Australians have yet to embrace Halloween in all its glory. While we're slowly playing catch-up with our American friends we are a long way from October 31 being fully embedded in Aussie culture.